Donut Overload Iced Coffee TowerChoc-a-block, double donut, whipped cream sprinkle towers! 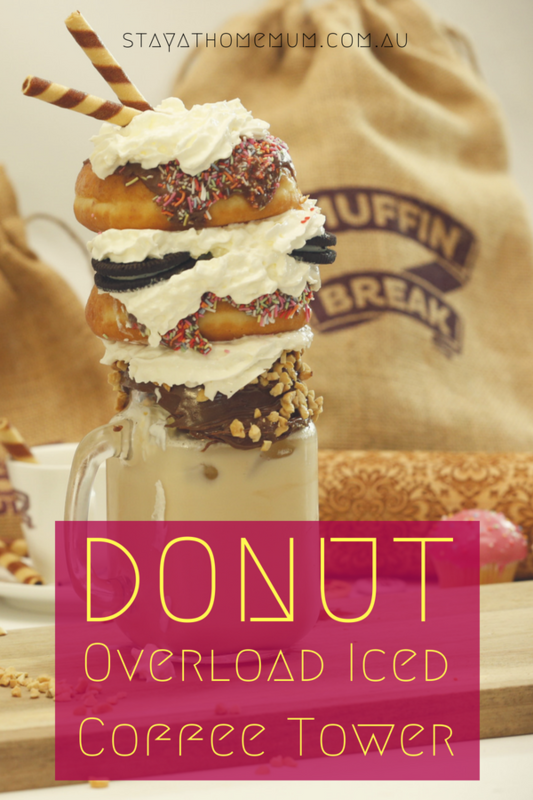 This Donut Overload Iced Coffee Tower is to die for! Our loaded Iced coffee is every sweet tooth’s dream drink.. I was drooling while stacking together this masterpiece. Loaded milkshakes are the latest craze in the creative food world and are a sight for sore eyes. I’ve seen shakes stacked with cakes, muffins and even hamburgers but this one.. the Donut Overload Iced Coffee Tower is the best by far! You can try all sorts of flavours, the options are limitless but the double donut stack is by far a personal favourite. Top your stacked tower with all of your most loved toppings and see how tall you can build it! In a glass jar coat the outside of the rim with a thick layer of Nutella. Place the crushed nuts onto a plate and coat the Nutella covered rim. Place a handful of ice into the jar and pour the shot of coffee and milk in together. Spray the whipped cream on top of the iced coffee and start your stack. Place a donut on the base of the jar rim and top with more cream. Place the oreos onto the donut and top with more cream. Add the second donut, top with cream and a straw. Add your favourite toppings, cocoa, sprinkles or flakes!